Palestine’s long-overdue municipal elections, the first since 2006, were originally meant to take place on October 8, with residents from both the Gaza Strip and the West Bank taking part. But then they were suspended, and the Palestinian High Court announced that the elections will only go ahead in the West Bank, not Gaza. The Fatah-controlled High Court in the West Bank said that it had suspended the elections because they weren’t being held in East Jerusalem, viewed as the capital of the future state of Palestine, and because of a dispute with Hamas over candidate lists – another twist in the ongoing political wrangling between the two Palestinian factions. But even after the final date of the elections is announced, there will be all sorts of other issues to surmount. And not least among them is the representation and treatment of women. Palestinian voters have not voted in Palestinian Legislative Council elections for years, and they’ll soon be confronted with an electoral process that is far from simple. The elections will use a proportional representation system with closed candidate lists. These are complicated by a formula system which calculates quotas for each list. A 20% minimum representation level for women has been set, but it’s only a recommendation and has no actual legal standing. And even though at least some women will be on the candidate lists – the complex system ensures that councils with more than 13 seats must include at least three women – their identities will be stripped from them in the process. Their own names are not listed publicly, as this would be haram (forbidden under Islamic law). So they will appear only under the names of their husbands, brothers or sons. Whereas their male counterparts are depicted in photographs on the list, the women are represented only by images of flowers. The effect of all this on young Palestinian women is noticeable. One student in the West Bank city of Jenin told me she couldn’t see the point of voting since she couldn’t know who the female candidates actually were. Fortunately, there are campaigners working in the West Bank to get this quota raised – and to change the way women are represented within this patriarchal society. Supported by the Ministry for Women’s Affairs, women’s NGOs in the West Bank have taken the initiative. They are running strong and co-ordinated campaigns against the suspension of the elections and corruption at government level, and also the religious and traditional discrimination against women that permeates political and social life in Palestine. Some are successfully persuading state radio to broadcast information on increasing the quota of women on lists to 30%. In my own ongoing research, I’ve found that women’s NGOs have broadcast over a third of all radio spots on the larger radio stations in the West Bank so far in 2016; they have generally focused on the elections and ongoing campaigns around female economic empowerment, harassment and domestic violence. Certain NGOs, such as PWWSD AWCSWand ADWAR are being more audacious. They’re organising demonstrations and even flash mobs, a concept new to the West Bank. In July, 18 to 35-year-olds were encouraged to protest against the electoral process in front of the legislative council building. 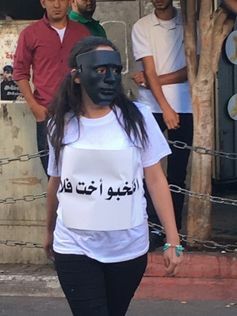 Flash mobs were organised in August in Ramallah, when women performed dances in t-shirts with “vote for us” printed on them, and again in September, when women actors displayed images of past and present female electoral candidates on their outfits and wore masks symbolically hiding their identity, which they discarded at the last minute. Other events to make women more visible and raise awareness of their problems are being organised and are attracting widespread media attention. But the campaign has already been long and arduous, and its exuberance hasn’t always been warmly received. According to AWCSW, female dancers and actors involved in the flash mobs had their banners torn down and were met with verbal abuse from male onlookers chanting “eib” (shame). To make things harder, even sympathetic citizens are preoccupied with other matters. Many West Bank voters aren’t just angry that the election has been suspended; they are also hungry for change within the apparently moribund PLC, which was last elected in 2006. This is an urgent problem, but like the improvement of women’s political representation, it won’t be resolved soon. Even as women’s issues get more support from government ministries’ newly formed “gender units”, campaigners working to improve women’s lot and win them more political power are up against a good deal of inertia and outright resistance. But awareness is nonetheless being raised as never before.